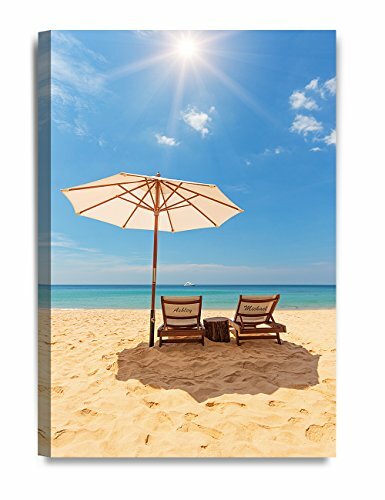 DecorArts - "Romance on Beach" - Personalized Canvas Prints Gift, includes Names and the Special Date - Perfect Gift for Anniversary, Valentine's day,Wedding. 24"x16"
Customrized artwork for couples showing their love in an old-fashioned style, a creative picture of two beach chairs with the names of the happy couple symbolizing the day they met and started their life together. How to order --- After checking out, pls go your order detail page, click on "Contact seller" to send you personal information for customizing your artwork. Personalize it with the couple's names and special date, etc. Made in USA: real handcrafted canvas prints produced and hand-stretched in California. Real wood frame(Non-MDF)& Museum-quality printed, UV-resistant colors, non-fading, vibrant, saturated colors for up to 80-100 years. Canavs Print Size: 16x24" Strengthened Depth: 1.5". Semi-Gloss Acrylic Coating applied to enhance appearance, and to protect the print from dirt and dust. This is personalized artwork, it is non-refundable. we will make it with your customized information just as you entered online, Please Check submitted information carefully. But if there is misspelling or wrong date on the artwork,pls contact us for a replacement. If you have any questions about this product by DECORARTS, contact us by completing and submitting the form below. If you are looking for a specif part number, please include it with your message. Green leaf art #A077 - Set of 4 art prints (8x10).Green wall art.Palm leaf wall art.Botanical art.Botanical prints wall art. Nature art botanical.Painting.Nature art.Nature wall art.Green wall art.